‘Music is the soul of language’ (fortune cookie message, San Francisco, 20 06 2013). The cookie’s ‘wisdom’ is a misquotation. It should read: ‘Music is the language of the soul’. This has been a commonplace sentiment in music theory over the centuries. It’s derived from a crude essentialization of Plato’s discourse on the nature of music and its relation to the soul and the emotions, the education, and the physical and moral actions of humankind. The inversion of ‘language’ and ‘soul’ renders the adage nonsensical as an expression of a general truth. However, in its particular application the saying can make sense … of sorts. Language and music share many components and qualities such as pitch, melody, timbre, rhythm, and timing. The American minimalist Steve Reich has endeavoured to make these connections explicit, exploiting the musicality of speech to structure his compositions. It’s Gonna Rain (1965) is the earliest and a prime example of this process. 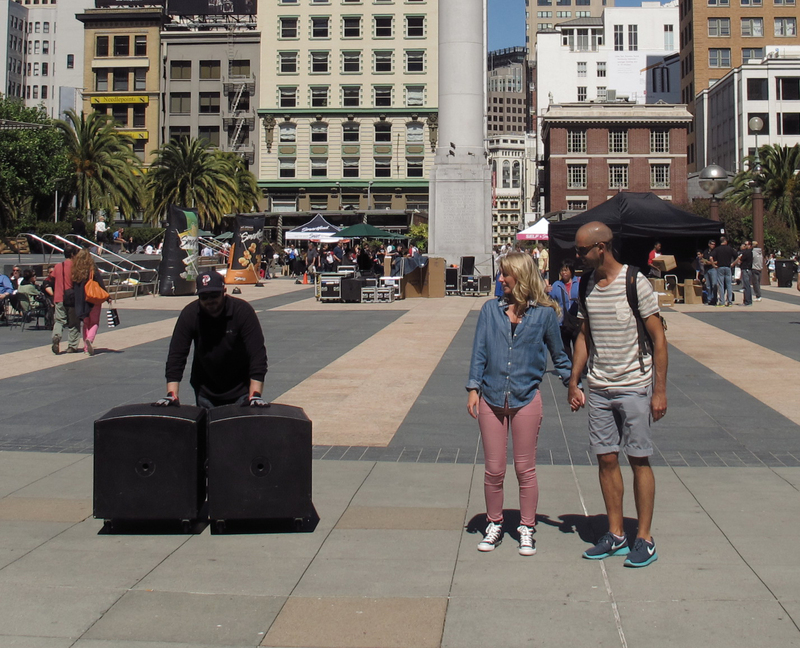 The work is based upon an extemporary evangelistic sermon spoken by an African-American street preacher, and recorded one evening in Union Square, San Francisco a year earlier. In some traditions of so-called ‘black preaching’ music is conspicuously the soul of the language. The delivery is characterized by a ‘sing-song’ melodiousness, poetic rhythm and cadence, and breadth of dynamic range, as well as a flare for striking imagery. The earnest efforts of the preacher, Brother Walter, were a gift to Reich in all these respects. The composition is divided into two sections, each based upon an extract from the sermon. In the first section, the preacher proclaims: ‘He begin to warn the people. He said: “After a while, it’s gonna rain after a while; for forty days and for forty nights”. And the people didn’t believe him. And they begin to laugh at him. And they begin to mock him. And they begin to say: “It ain’t gonna rain!”’ At one point, the preacher taps either his bible or foot emphatically as he speaks. In the background, one can hear the voice of a black woman remonstrating, the hubbub of the listening and passing crowd, as well as the twitter of birds. These are the sounds of normality over which he preaches a message about calamity. Reich cuts to the semantic essence of the sermon by editing, repeating, and compressing specific phrases from the text. The reorganization is self-evident. We can hear it in action. However, the outcome of the process, by which two identical recordings of Reich’s collage played on independent tape recorders are transformed as the machines slowly move out of synchronization with each other, is unforeseen (‘unforeheard’). It is a spectacular (auricular) exemplification of the principle that a small intent can sometimes lever an enormous change. Four phrases are abstracted from the source: ‘it’s gonna rain’, ‘it’s gone’, ‘it’s, and ‘rain’. As these samples are looped, superimposed, and played against and out of phase with each other, their syntax and sense gradually surrender to tone and rhythm. New and previously unnoticed noises present themselves. A polyrhythmic sound, like an anxious, racing heartbeat accompanied by the pitter-patter of raindrops on an umbrella is heard as two phrases that include the preacher’s percussive tapping are overlaid. As the samples drift further and further out of phase, one may distinguish the auditory equivalent of a Moiré pattern along with ‘false’ words and phrases (apophenia) not spoken by the preacher, such as ‘hit me’ and ‘hip’. They are fortuitous – a bi-product of the process, but in keeping with the urban parlance of that time and place. Progressively, the composition mutates from language to music to noise and, ‘after a while’, to comprehensibility once again. Reich rewrites the text as follows: ‘Glory to God. God … had been sealed … couldn’t open the door … Noah! Noah! … they cried … couldn’t open the door … couldn’t open the door … but sure enough … hallelujah! …’. The phrase-strand is looped first in unison and then in syncopation, doubling and rising to an imperfect canon for four voices. The drawl of the traffic in the background – the acceleration and deceleration of engines – serves as a readymade glissando. As the section develops, the preaching sounds more urgent and frantic and the preacher’s voice, increasingly inchoate; his syllables gurgle and drown in their own echoes. At the climax of the section, an Armageddon of noise finally and fully inundates all comprehensible sense. The theme of the sermon, Noah’s flood, was neither incidental nor untimely. The story had a profound contemporary relevance. 58 years earlier, San Francisco suffered a devastating earthquake and subsequent fire. (In the Hebrew Bible, earthquake, fire, and flood are considered, alike, the external corollaries of God’s judgement upon sin.) Two years previous, in 1962, the world stood at the brink of mutually assured destruction (waiting for the bombs to rain from the sky) as the USSR and USA engaged a 13-day nuclear stand off known as the Cuban missile crisis. On the same day as the San Franciscan earthquake, the Los Angeles Times published a front-page report on the so-called Azusa Street revival, which, historically, marked the birth of Pentecostalism. From its inception, the movement was characterized by the exercise of supernatural gifts, including glossolalia or ‘tongues speaking’. This is, practitioners believe, a sacred language – spoken, unlearned, and often unknown to the speaker – facilitated by the power of God. The impression of tongues speaking is that of unintelligible speech produced by the rapid improvisation of sometimes Hebraic-sounding syllables that are often repeated again and again and trip over one another. The effect of several Pentecostals speaking different tongues at the same time is not unlike the sound of the multiple, phased voices in It’s Gonna Rain. Conceivably, Brother Walter (a second-generation Pentecostalist) was a member of the ‘Latter Rain’ order, which arose out of Pentecostalism after the Second World War. The name was taken from a reference to ‘the latter rain’ in the book of the prophet Joel, chapter 2, and verses 23-9. Followers of the order emphasized the belief that humanity was living in the final days before the Last Judgement. Accordingly, the preacher used the story of Noah’s flood eschatologically, to foreshadow a divine punishment of an unimaginably greater magnitude that was yet to come, and soon. His sermon is noteworthy in respect to its content also. Surprisingly, not least given Pentecostalism’s fundamentalist theology and inerrantist biblicism, the narrative is profoundly unscriptural. For nowhere is the account of the flood is there any indication that either Noah warned unbelievers about the onset of rain, or that they mocked his insistence in this regard (Gen. 6-7). Neither is there any specific description of the plight of the unrepentant and the skin coming off their hands (in flat contradiction of what the preacher was at pains to point out). However, within rabbinic Judaism (Talmud) there are stories about Noah warning and being mocked, and also an indication in the Q’ran that he preached about a future deluge. Brother Walter’s embellishment and misreading of the biblical text probably owed more to pictorial representations of these themes, popularized in illustrated children’s bibles during the first half of the twentieth century. It’s Gonna Rain, as I’ve indicated, processes not only the preacher’s address but also the ambient noise and acoustic character of Union Square. Voice and context are inseparably bound up with one another. The Square is, in effect, the roof-top of a large garage. The space beneath was originally built as a hospital and bomb shelter (a kind of ark) after the attack on Pearl Harbour in 1942. 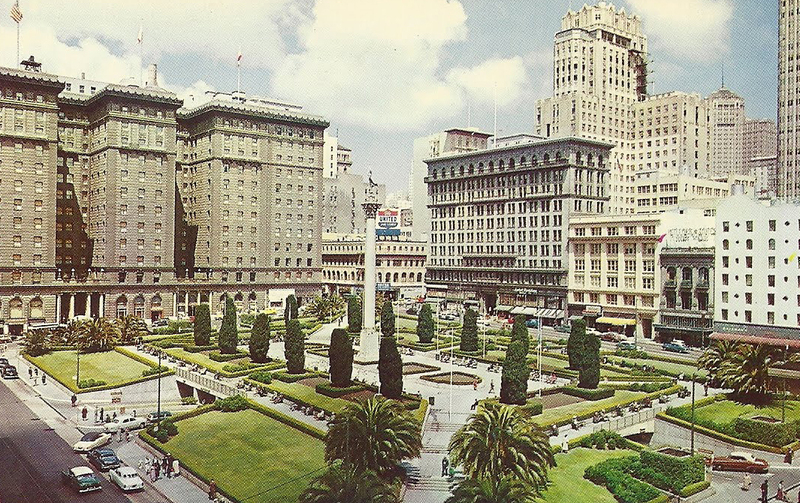 In 1964, when Reich made his recording, the Square was, as it is today, boxed in by commerce: stores, banks, and hotels. The pathways were arranged symmetrically with the Dewey Monument at the centre of a rectangular plaza flanked by flowerbeds, bushes, and palm trees (see illustration at the head of blog). Today, the Square’s furnishings are paired down in favour of a bland and open thoroughfare that provides space for live music, open-air movies, and art installations. 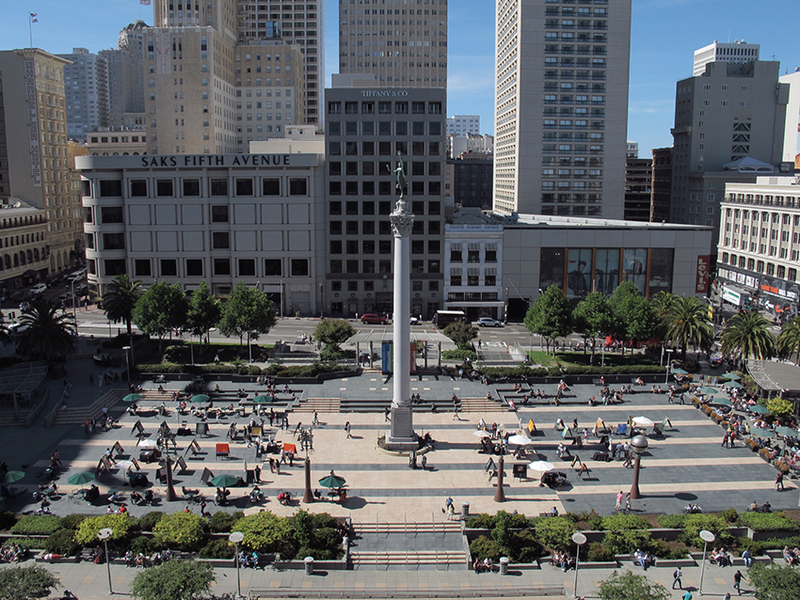 The sounds that one can hear (and record) on the plaza include birdsong and the grind of motor engines (much like Reich captured nearly fifty years ago), together with hooting horns, the clatter and chime of cable cars, intrusive cell-phone conservations, and airplanes passing overhead. They are set against the tinny pulse of hip-hop and dub muzak (which It’s Gonna Rain did so much to inform) that drifts from wine bars on the Square’s periphery. Sometimes there is, too, the sound ‘as of a rushing … wind’ that rises briskly, rustles the palm leaves, and portends the onset of rain (Acts 2.2).